Giovanni Fiore recently got sent back to the San Diego Gulls meaning he’s unlikely to make the Anaheim Ducks opening night roster. It was a different story for Fiore last season as he earned a spot on the Ducks’ roster out of the preseason. This was a bit of a surprise to many Ducks’ fans who might have expected a more high-profile name like Sam Steel or Max Jones to make the team out of training camp, but it was Fiore who earned his spot on the roster instead. A new season brings new opportunities for all players. Which players are embracing the opportunity and competing for a surprise spot on the Ducks’ opening day roster? Kiefer Sherwood signed on with the Ducks in March this year. 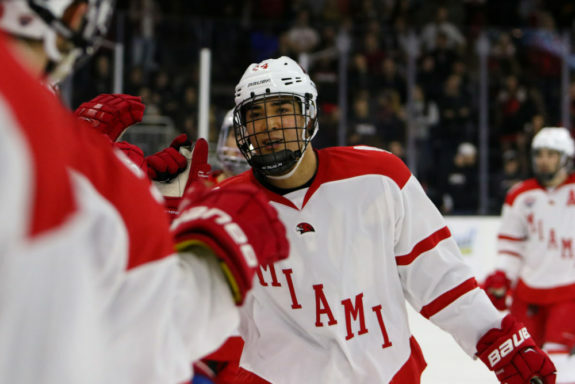 He came over from Miami of Ohio University where he was known for having high level skating ability and an NHL level shot. That’s something the Ducks could use a lot of as they transition to a faster game. He’s survived two rounds of cuts from the Ducks training camp, and is getting a solid look from the coaching staff. In the preseason, he’s averaging 14 minutes a night and has significant time on the penalty kill. Clearly, the Ducks have higher expectations of him than just a bottom 6 plug. That being said, Sherwood doesn’t quite have the ability to crack the top two lines, so where does he fit in the lineup? Nick Ritchie is still yet to sign a contract with the Ducks. Given Ducks’ general manager Bob Murray’s penchant for taking his time in these matters, it seems unlikely Ritchie will be in the lineup opening night. Perhaps Sherwood fills the hole left on the third line by Ritchie. His skating and shot could compliment linemates like Ondrej Kase and Adam Henrique, Ritchie’s usual linemates last season. Maybe he could find chemistry with Steel who is likely to earn a spot on the roster while Ryan Kesler remains unavailable to the Ducks. Sherwood has caught the eye of the Ducks’ coaching staff, and now needs to step up and prove he deserves a spot with the big club. Maxime Comtois was a second-round draft pick of the Ducks in 2017. He’s only 19 years old, so it seemed likely he would get sent back to his QJMHL team the Drummondville Voltigeurs. His strong play in the Ducks rookie camp and preseason could alter those plans. Comtois has good size and is responsible in all zones on the ice. That defensive responsibility will always catch the eye of the coaching staff, especially in a young player. He was able to find good chemistry with top Ducks prospects Steel and Troy Terry during the rookie faceoff in Vegas where he led all Ducks skaters with four goals and three assists for seven points in three games. 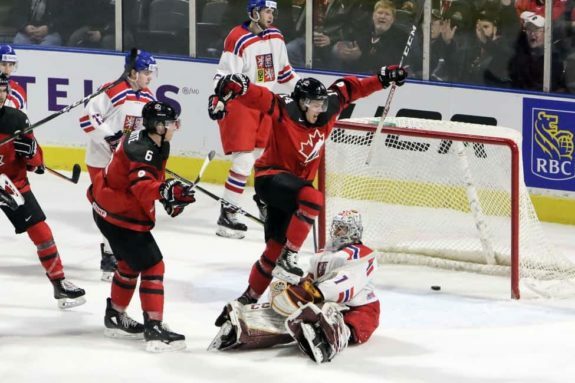 He also played on the 2018 gold medal-winning Canadian World Junior team with Steel. His strong play in the preseason could lead to a spot in the lineup, but where does he fit in? Like Sherwood, he could slot in very well where Ritchie would have gone if Ritchie had a contract right now. Comtois’ case is interesting as the Ducks likely see him as a top-nine forward in this league and seem unlikely to play him on the fourth line should he get a chance with the team. Given his Junior eligibility he’ll either play in the NHL or the QJMHL. No chance he plays for the San Diego Gulls, the Ducks AHL affiliate this season. He would be the most likely candidate to get a nine-game tryout, much like Jacob Larsson did in 2016. One thing is clear, The Ducks like what they see and are giving him an extended look. When the Ducks drafted Isac Lundestrom 23rd overall at the 2018 draft, many people didn’t bat an eye. It was seen as a safe pick, especially as highly touted prospect Joe Veleno fell further and further down the draft board. He’s likely going back to Sweden to play for Lulea HF in the SHL, but he has survived two rounds of preseason cuts and, like Comtois, had a strong showing in the rookie faceoff. It’s unlikely they keep him around to play in the regular season, but his extended stay means he’s leaving a strong impression with the Ducks organization. As I mentioned above, Giovanni Fiore was sent to San Diego. Perhaps a bit disappointing after making the team last season. Kevin Roy and Kalle Kossila both spent time with the Ducks last season, but have been absent from the preseason games due to injuries. 2016 first round draft pick Max Jones is also out with a thumb injury. All three will be looked at to take a big step this year, or falter into the AHL.